Thomas Miller raises to 200,000 before the flop and Robert Garofalo three-bets to 540,000. Miller calls and the flop comes [9s][7h][5s] and Garofalo bets 500,000. Miller announces that he is all-in and Garofalo immediately calls. The turn is the [7d], giving Garofalo trips. The river comes the [Ac] and Garofalo wins the pot. Thomas Miller is eliminated from the $600 No-Limit Mega Stack Challenge in 3rd place. Prior to Miller's elimination, the three players agreed on an save that guaranteed all players $29,000 with the winner taking home a total of $42,102. The board runs out [Ad][Qs][2s][Kd][3s] and Grandieri wins the pot. Long Tran is eliminated from the $600 No-Limit Mega Stack Challenge in 4th place for $16,222. A short-stacked Andrew Eiger gets all-in before the flop with [Qc][2c] but runs into the [Kc][Qh] of Robert Garofalo. The board runs out [Kh][3s][2d][5h][9s] and Garofalo wins the pot with his pair of kings. Andrew Eiger is eliminated from the $600 No-Limit Mega Stack Challenge in 5th place for $12,205. David Garofalo raises to 125,000 from under the gun and Arun Korvi moves all-in for 640,000 more. The board runs out [Kh][6s][5h][4h][3h] and Garofalo improves to a flush to win the pot. Arun Korvi is eliminated from the $600 No-Limit Mega Stack Challenge in 6th place for $9,330. Robert Garofalo raises to 160,000 before the flop and Anderson Almonte three-bets an additional 325,000 from the big blind. Garofalo moves all-in and Almonte tanks for a few moments before announcing call. The board runs out [Ad][Kh][5c][9h][Jc] and Garofalo takes the pot with his trip aces. Anderson Almonte is eliminated from the $600 No-Limit Hold 'em Mega Stack Challenge in 7th place for $7,244. Damon Hilton moves all-in before the flop for his last 230,000 and is called by both Arun Korvi and Robert Garofalo. The flop comes [8s][6d][3h] and both players check. The turn is the [8h] and Korvi checks again. Garofalo bets out 250,000 and Korvi calls. The river comes the [4s] and Korvi checks one more time. This time, Garofalo fires 500,000. Korvi mucks and Garofalo turns up [Ad][8d] for trip eights. Hilton says he only looked at one card, the [Ac]. When he flips his other card over, it is the [As]. Hilton is eliminated from the $600 No-Limit Hold 'em Mega Stack Challenge in 8th place for $5,708. On a flop of [Js][5d][4s], Lou Pito checks to Long Tran. Tran fires 110,000 and David Grandieri calls. Pito then moves all-in for an additional 550,000 and Tran moves all-in on top. The turn is the [7s] and the river comes the [2c]. Tran takes the pot with his pocket aces. Lou Pito is eliminated from the $600 No-Limit Mega Stack Challenge in 9th place for $4,584. The remaining eight players are now on a one-hour dinner break. Arun Korvir raises to 80,000 before the flop and Richard Zisk moves all-in for less with his last 45,000. The board runs out [7h][6d][5h][4d][Ks], giving both players a straight, but Korvir the better straight. 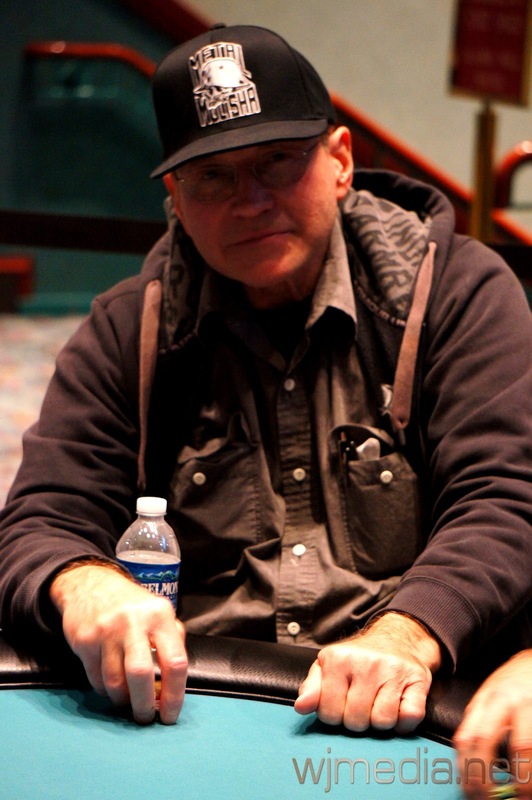 Richard Zisk is eliminated from the $600 No-Limit Mega Stack Challenge event in 10th place for $3,687. We have reached the final table of the $600 No-Limit Hold 'em Mega Stack Challenge event. The blinds are currently 15,000-30,000 with a 5,000 ante for another 15 minutes. We had a total of 297 entrants in the $230 No-Limit Hold 'em Mega Stack Challenge Bounty event. In addition to the payouts below, you earn $100 for every person you eliminate. Day 2 of the $600 Mega Stack Challenge Now Streaming Live! Day 2 of the $600 No-Limit Hold 'em Mega Stack Challenge event is now underway. With 45 players remaining, the average chip stack is currently just over 237,000.